This as a delicious lunch that we enjoyed today. The recipe could also be used as finger foods at a party or as an appetizer in smaller portions. Chop the onion and peel and chop carrots. Add the onions and carrots and sauté lightly. Peel and mince or grate the ginger and add to the carrots and onions. Cut the apricots into pieces and add to the carrots and onions. Bring the heat down to simmer. Add the seasonings and lemon juice and simmer until the carrots, onions and apricots are all soft. Puree the mixture to a smooth sauce. Keep the sauce warm on a low heat. Mix the ketchup and Thai chili sauce in a medium bowl. Prepare the broccoli by cooking and blanching (plunging the cooked broccoli into cold water). Heat a lightly oiled skillet. Spread some of the tomato-chilli sauce on 1/2 of a flour tortilla. Add a generous amount of broccoli (about 1/4 cup). Top with some grated non-dairy cheese and fold the tortilla in half. Place the tortilla in the skillet and cook until lightly browned. Flip the tortilla over and cook on the other side until lightly browned. When done, remove from the skillet and place on a plate. Continue until all the quesadillas are prepared. 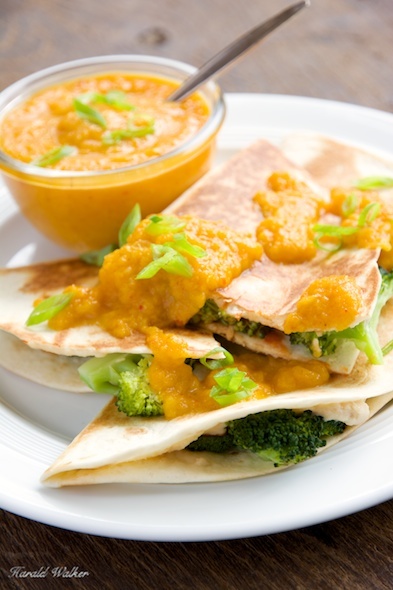 Serve the quesadillas with some of the apricot-carrot sauce and garnished with some chopped chives or spring onion tops. 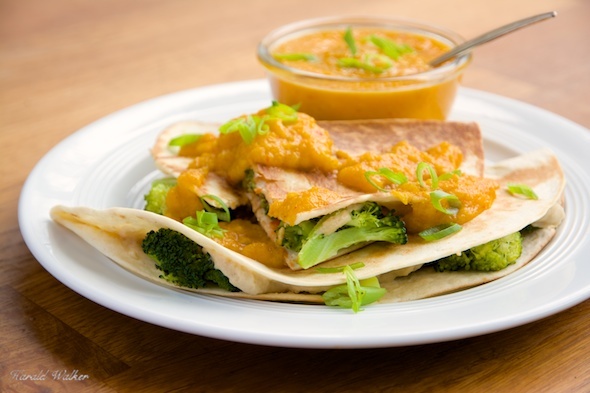 Posted by Chris Walker on April 30, 2013 in Apricot, Broccoli, Carrot, Main Dishes.